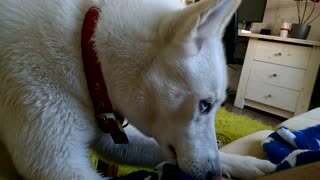 Rumble / Dogs & Puppies - Mya the husky needed to be doused with a new flea spray and she is NOT happy about it. 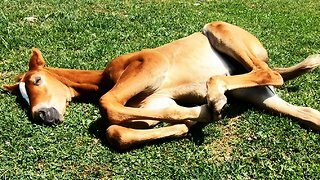 After her owner was done spraying her, she ran away and lay down with her face turned away from the owner. Now she won’t even acknowledge her calling her name! 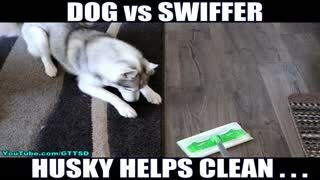 It is rather unfortunate that her owner betrayed the husky this say, knowing how she hates the flea spray. Fleas can be a terrible infestation, but isn’t there another way? Now she’s furious with the woman and refuses to look at her. 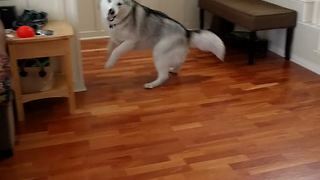 But there is something that the human knows about Mya that can be used against her and for the entertainment of everyone online. See, Mya has a favorite song, one that she can’t help but sing along to and that is ‘Tomorrow’ from the classic movie Annie. We know, that song is evergreen and even if you don’t know the lyrics, you are able to sing along to it! 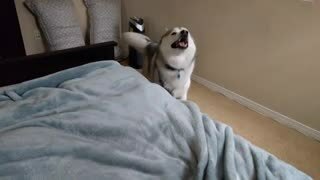 Can the adorably mad husky resist her favorite song? 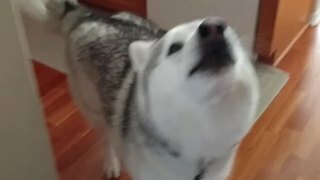 The woman hasn’t even finished the second verse, when the husky starts howling! 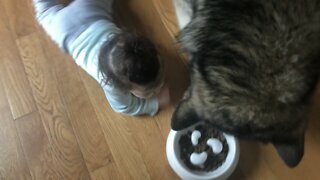 Aha, there’s Mya’s weak spot! She just can’t resist those lyrics, it is insane! 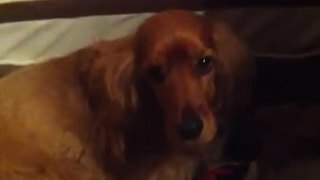 If you listen very closely, you can hear that when the line “I love yah, tomorrow” comes, Mya joins in with a faint, but audible “I love you” and a few second later she does turn around. Gosh, we are melting!